This book is a great read, it is an understandable, and an engaging book. It is written from the perspective of a Christian counselor who, for forty years, has worked with youth in a youth ministry setting. I believe the only thing that could have made this book any more real would be if he, the author, had fought and struggled with same gender attractions himself. Schmierer, the book’s author, takes the stories from those whom he has counseled and interjects them into the book to illustrate the concepts he is explaining. Although the author is not a professional psychologist he brings practical thoughts, life experience, and the maturity of a Godly man into the book. He also blends data and observations from his research. An updated edition of this book would be welcome as many of his footnotes are no longer valid given the demise of the websites he listed such as Exodus. I will be recommending this book to parent support groups for those having a same gender attracted child. I also will recommend it to those who struggle with unwanted same gender attractions as it will be helpful in identifying what some of the reasons are for a person experiencing same gender attractions. I will also be recommending it to pastoral counselors and youth ministers. I do wish Schmierer would have balanced his examples with more female stories. 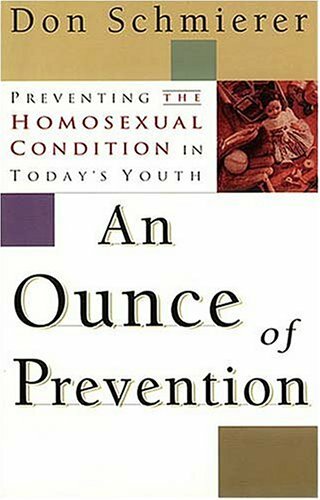 Most books, this one included, tend to focus more on male homosexuality and every once in awhile they remember that women are affected as well by same gender attractions. For Christian families looking for some understanding on homosexuality, they will find this book helpful though I must also recommend a more helpful book for parents needing support and do not have a group to attend. Joe Dallas’ book, When Homosexuality Hits Home, will cover areas this book does not on the matter. Schmierer states that his primary purpose is to discuss possibilities for preventing same gender attractions to form in their children. He hits the nail on the head when he speaks about the need for a healthy family, especially in regards to a loving and strong father figure. Again though the author keeps speaking in regards to the male child and rarely speaking on the importance of the female child having a loving and strong father figure. Overall, a good book, with some changes it can be an even better book. None the less you will be better in having read the book especially if your loved one has same gender attractions or if you yourself have same gender attractions and you are looking for some insights. Lastly, as one who identified as a lesbian for almost 21 years, I must totally agree with the author when he speaks about the possibility of people walking away from their same gender attractions and having their attractions now toward the opposite gender. Through a loving and accepting church my emotional broken areas were repaired. Once that happened the same gender attractions faded. Change is indeed possible and I believe homosexuality can be prevented. A healthy loving family gives the child the best chance. I hope you enjoy your reading of this book.